I originally picked up this book for one reason, and one reason only... I was hungry, and it had a picture of an Oreo on the front cover. Unfortunately, I took it home and it's been sitting in a pile in my office until yesterday when I realized it was on the Starred Book List that Bookshelfer compiled. Granted, it was pretty far down the list, but it caught my attention. Regardless, I'm really glad I read Slob by Ellen Potter. The main characters deviate from any kind of typical and I enjoyed them immensely (with one exception). The main character, Owen, has started to overeat in the past two years, and has become quite large (57% fatter than other kids his age). Potter does a fabulous job dropping clues throughout the story as to why that happened. Owen is also quite the inventor. Owen's younger sister, Jeremy, is part of a group of girls who have decided to get equal rights by adopting boys' names. Owen's neighbor is Nima, who grew up in India and has just recently moved to New York City. Nima makes his living by selling momas, a type of dumpling, from a cart on the sidewalk. One other very important character in this story is Mason Ragg. One side of Mason's face looks deformed, he works with a special aide from time to time, and everyone at school believes he carries a switchblade under his sock. Finally, there is the P.E. teacher who is quite detestable. Because I found him so unlikeable and downright mean, I was glad that Potter gave him the name Mr. Wooly. He was the epitome of a teacher who wants to degrade students, not teach them. Yuck! This ecclectic cast of characters each has their own issues, but the way Potter intertwines their lives is quite interesting. There seems to be a surprise awaiting the reader at every twist and turn. The details of the characters' lives are given to us a little bit at a time. There are several times I found myself saying, "You're kidding me!" I honestly did not see certain plot twists coming. The reason the book has its title is nothing that I expected, but it makes for a very poignant ending to the book. The word I found myself saying about Potter's style, pacing, and plot twists was "subtle". She did a great job of misdirecting the readers' thoughts about the characters and what happens to them. I'm not sure Slob is a book that will win the Newbery, however, it is most definitely a book that should be in classrooms. It would make for great conversation about stereotypes, about looking at more than just the outside of a person, and what motivates characters to do the things they do. Slob is a very good story. Before Molly Williams' father died, he left her a gift. He taught her the art of throwing a knuckleball and she is able to throw it with incredible accuracy. It is the one piece of her father that she is able to really hold onto since her mother has become distant and the two of them are struggling through their grief. Not only did Molly's dad teach her to throw the knuckleball so that it danced and floated like a butterfly, he taught her the love of baseball. Molly is intrigued by all of it, the ball parks, the players numbers and the statistics. In fact she thinks of life as a baseball game and people she comes in contact with earn points in her batting average of life scoring system. Another way she copes with her father' death. When she discovers some of her father's belongings including a reporter's notepad, she hopes to learn more about his death. Unfortunately, the notepad is blank, but it leads Molly to interview him in her imagination, another step in her grief process. Finally, Molly decides to try out for the baseball, rather than the softball team, at school. Even though some of the boys don't want her on the team, the coach recognizes her talent, and has an appreciation for the knuckleball, puts her on the team where she meets a friend. Oddly enough, it is on the baseball field where the healing between mother and daughter begins. It's been a while since I read this one, but I do remember marveling at the language and softness of the story. Author Mick Cochrane weaves the themes of baseball and grief together creating a touching story. I like this one a lot. Back in the summer, I read When You Reach Me for both a first and second time. It absolutely knocked my socks off both times. Because it is getting so much "buzz" with regard to the Newbery, and because I wanted to pick a great book for my class read aloud coming back from holiday break, what better book than When You Reach Me?! Just to triple check myself, though, I reread it for a third time yesterday. I am amazed that even in a 3rd read, this book just continues to both surprise and delight. In the review I posted this summer, Mary Lee (A Year of Reading) posted a comment about how great the chapter titles were as well. She said they would make great writing prompts. Better yet, since I missed the connection the first two times, is how well the titles correlate with an important strand in the story. I don't know how Rebecca Stead managed to tie up all the story strands by the end of the book. She is truly a gifted author. 1) It is on the Mock Newbery list for the Allen County Library. 2) It made five of the "best of the year" lists (thanks to Jonathan Hunt at Heavy Medal for this post). 3) Out of 6 possible review journals, it received stars in 5 of them (thanks to Shelftalker for the 2009 Starred Books Wrap-Up). 4) It made Fuse #8's mid-year Newbery prediction list. I truly believe that When You Reach Me by Rebecca Stead is a book worthy of the Newbery award. Fingers crossed until January 18!! One of the things I enjoy about Looking for Newbery is that it gives me a chance to go back to something I read several months ago and remember why I wrote about it. This is one of those titles. I wrote about All the Broken Pieces here, back in September, so again I hope this book has not been lost in the shuffle of newer titles on Newbery lists. After re-reading my journal, and blog post I am reminded about how powerful this free verse novel is. Ann E. Burg takes the events surrounding the Vietnam conflict and brings them down to a level that a middle school student can relate to and understand. The main character, Matt Pin, is adopted into an American family after being airlifted out of his home country. He struggles with the guilt he feels about leaving his mother and disabled brother behind. He puts up with the prejudice from classmates who have had relatives killed in Vietnam. He helps a support group for Vietnam vets deal with their feelings after returning home. I didn't purchase this book for our library, but would highly recommend it for the middle school library. A Season of Gifts by Richard Peck is another book that has appeared on the mock Newbery list of the Allen County Library. In addition, I have been following what the Heavy Medal blog has to say about the Newbery. Recently, one of the contributors to Heavy Medal, Jonathan Hunt, compiled a list of books that won some important children's book awards throughout the year. A Season of Gifts has appeared on three of those major award lists. It was also on Shelftalker's 2009 Starred Books Wrap-Up -- it was a starred book in five different review journals (out of six possible). Before I even read A Season of Gifts, I knew it must be a book worth reading. Someone I used to teach with is a huge Richard Peck fan; he will read the latest Peck book as soon as it comes out. Somehow I never had the desire that he did, so when I found out that A Season of Gifts was a companion book to A Long Way From Chicago and A Year Down Yonder, books I hadn't read, I was a little concerned that I would not have the background knowledge sufficient to understand the nuances of the story. I might have been missing snippets of information, but I found A Season of Gifts to be delightful as my first read about some of the characters. What I know for sure is that now I will be going back and reading those earlier books. A Season of Gifts was a true joy to read. It deals with the relationships between a new family that moves to town and the wonderfully eccentric Mrs. Dowdel (a character from the companion books). Though Peck focuses on the new family, the Barnharts, Grandma Dowdel is still a very important character who manipulates (in a good way) situations that help the new family move to acceptance in their new community. The Barnharts are a fun family to know. The dad is a preacher trying to start a new church in town. The mom is the glue that holds everyone together (very 1950ish, which is appropo since this story is set in 1958). Phyllis is the teen-age sister who loves Elvis Presley, falls for a wild guy and makes some poor choices. Ruth Ann is the inquistive little sister who is fascinated by their new neighbor, Mrs. Dowdel. Bob, the only boy, is the narrator of the story. The language in the story is truly beautiful. The character development is wonderful, and the plot kept me wanting to read. It is also set in a year where I was 3 years old (my students call that historical fiction!) which made it appealing to me as well. I can understand why A Season of Gifts has found its way to so many lists of good books. Finally, I want to say thank you to the student who got me this book for Christmas. Thanks GS!! It was truly a wonderful gift! It's that time of year, when folks start making their predictions for the Newbery winners and Karen and I are no exceptions. Both of us got interested and started in this blog thing when we were asked by our friends at A Year of Reading to "guest blog" our picks three years ago and we've never looked back. Last year we took a big jump into the pool and did a month of reviews based on THE LIST over at Fuse #8 and called it "Looking for Newbery." We had so much fun we thought we would do it again. Karen chose me to kick it off, so here we go...WELCOME TO LOOKING FOR NEWBERY 2010! Our first source of titles is the list over at Allen County Public Library. Honestly this the first internet Newbery prediction lists I found, and I still think it's one of the best. We divided up their list and were pleasantly surprised to find that between the two of us we have already read and/or blogged nearly half of the books on the list. 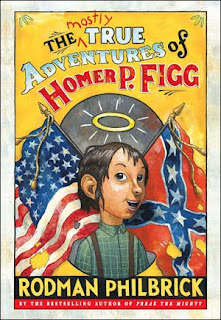 One title I read a year ago that I'm a bit surprised and disappointed that I didn't write about it earlier is The Mostly True Adventures of Homer P. Figg by Rodman Philbrick. Told in first person from the perspective of Homer, the historical fiction is set during the Civil War. Homer is a habitual liar and is capable of telling some real whoppers. He and his older brother Harry were orphaned at a young age and custody is given to a cruel uncle Squinton Leach (great name) who abuses them and makes them sleep in the barn. Homer's lies get him into trouble, but Harry is constantly protecting him and keeping the trouble from getting bigger than the two of them can handle. Homer's world comes crashing down when the cruel uncle sells Harry into the Union Army even though he is not of age. When Harry leaves, Homer decides to follow him and get him out by proving that he's too young to be in the army. This is where the adventure begins. On his journey Homer meets up with some interesting characters. He is kidnapped, meets up with a Quaker who works on the Under Ground Railroad, joins a circus where he is billed as the Pig Boy, hucksters, swindlers, Civil War spies and other interesting characters. In the end Homer and Harry meet up on the fields of Gettysburg where they take part in one of the most famous battle of the Civil War, Little Round Top. I loved this book with it's mix of humor and history. Homer is a lovable character even though the reader knows throughout the book that he is a liar. Rodman Philbrick's writing is amazing. He brings the reader into the story from the start and doesn't let go until the end. His word selection and character development kept me reading and admiring his work from beginning to end. Even though this book is on several lists, it came out in December, I hope it's not forgotten! I love the holiday break!! I stopped by my local public library yesterday, picked up 3 fun adult books to read, 1 picture book (more on that later in this post), and a lot more of Louise Borden's books (our school's visiting author in January). Knowing that I have a week and a half ahead of me full of big chunks of free time, I can't wait to curl up and read! 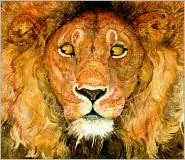 I still have a Christmas "to do" list so I'm not ready to dive into all the adult books, but I did curl up with the picture book I got -- The Lion and the Mouse by Jerry Pinkney. I'm not sure how, but somehow this book escaped my attention until Mary Lee (A Year of Reading) recently used it as one of her mentor texts in a study on theme and literary essay. I made a mental note to myself to look at it sometime, so when it was displayed on the "New Books" shelf at the library, I just had to grab it. Many of us grew up reading and knowing Aesop's Fables with their simple morals and themes. Pinkney took this story and created a wordless picture book that tells the story. The Lion and the Mouse is a visual feast for the eyes. There are many wonderful things about the illustrations, but I specifically loved the strength and kindness Pinkney manages to convey in both the lion and the mouse. the ability to find "theme"
I haven't been following a lot of the mock Caldecott lists but I would have to believe this gorgeous book is on most of them!! Today is our district's last day of school before holiday break. As I look back on these past 4 months, I realize how far my students have already come. What is wonderful (and challenging as well) is knowing how much further we have to go. But, for the next two weeks, I plan on putting my students aside, and focusing on my family, my friends, and myself. Two glorious weeks full of wonderful happenings, and also many days with nothing to do but curling up with a book and maybe even the computer to post a few blogs. Heavenly, right? We are truly blessed to have such a lovely break. In addition, Bill and I are currently in deep discussions online with our fellow panelists about what books our group might recommend to make the short list for the Cybils non-fiction picture book category. Our panel is amazed at how many wonderful non-fiction picture books were written this year. If you haven't checked out the long list on the Cybils website, it is most definitely worth a look! Finally, Bill and I met for breakfast the other morning, and have committed to doing another year of "Looking for Newbery". We will begin right after Christmas, and each day one of us will post about a book on a mock Newbery list. Last year, we relied heavily on the list compiled by Fuse #8. Currently, we are looking at the Allen County Public Library list. We're also paying attention to what the folks at Heavy Medal are posting and thinking. Some wonderful books are listed, and we can't wait to dive in. We hope you'll join us in the next month or so as we try to read the book that just MIGHT win the Newbery -- hope lives eternal!! Stay tuned! I'm pretty sure that most people who read our blog also read A Year of Reading by Mary Lee and Franki. But, on the off chance that we have a reader or two who don't read their blog, you really need to check out what Mary Lee is doing this week at A Year of Reading. She has taken a somewhat difficult 4th grade writing task, literary essays, and is planning and reflecting on what this study might look like. I love getting inside the heads of smart educators! If you haven't already done so, check it out! Life-Size Zoo: From Tiny Rodents to Gigantic Elephats, an Actual-Size Animal Encyclopedia by Teruyuki Komiya is a delightful gem. I haven't shared it with my 5th graders yet, but I predict they are going to love it. The cover sets the stage nicely for what the reader will find inside the book. We see a life-size photo of a zebra. Right inside the book, the author gives a guide to the readers as to what each section of the upcoming pages will hold. As someone who is currently teaching non-fiction text characteristics and their purposes to her students, this immediately caught my attention. It is so important for students to know how to get the most information possible from each page of a non-fiction text. The pictures of each animal are not only life-size, but they also contain the most minute of details. Children will love looking at these amazing close-up photographs. The text beside each photo is minimal, but good. However, the sidebars on each page have very interesting details about both the specific animal in the picture (including its name) and details about the animal in general. The best part of the book is the pages that fold-out to accommodate the life-size features of the animal. My favorite fold-out was the picture of the giraffe with its tongue sticking out -- both gross and fascinating at the same time! To be "life-size", Life-Size Zoo is quite an oversized book. This is yet another reason to love this book and share it with children! 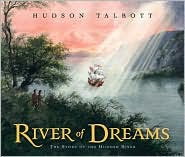 I just finished reading the most amazing book, River of Dreams: The Story of the Hudson River. It was written and illustrated by Hudson Talbott. He also wrote/illustrated United Tweets of America and illustrated Jacqueline Woodson's book, Show Way. Beyond the content of River of Dreams, this is a book to be savored for other reasons as well. Hudson Talbott has put beautiful illustrations in this story, using a variety of mediums: watercolors, colored pencils, and ink on watercolor paper. Within the illustrations, there is much to notice on each page. Sometimes there are inset pictures, there are many separate pictures about information in the text with accompanying labels or captions, and there is a river that "flows" through some of the pages containing timelines and other pertinent information. The pictures are truly a visual feast for the eyes. One of my favorite pictures is the one where the Hudson River is frozen and it shows how they used the frozen river for ice blocks. The cutting and gathering of ice is fascinating. River of Dreams: The Story of the Hudson River is a very smart book about a variety of topics using the Hudson River as a backdrop and done in a beautiful way. It's nomination to make the long list of the Cybils' non-ficiton picture book category was well deserved!! It is obvious that the author is passionate about the Hudson River and the area surrounding it. One of the books on the long list for the Cybils non-fiction picture book category is Eleanor: Quiet No More by Doreen Rappaport and illustrated by Gary Kelley. This book captured my attention from the gorgeous front cover: a picture of Eleanor Roosevelt, but not one word to be seen. It's a very flattering picture of Eleanor, but you can't help but be drawn into the force of the personality shown in this illustration. When I opened the book, the delight I felt just kept growing. Each 2 page spread is designed exactly the same way: there is a gorgeous picture, some information about a different part of Eleanor's life written in verse, and a quote from Eleanor that mirrors the information in verse. I literally could not quit turning the pages of this book. I loved this book as a reader, but as a writing teacher, I couldn't help but think what a fabulous mentor text this would be for one of my students writing a piece about a famous person. This format would breathe life into the information they discovered in their research. As a reader, I was drawn into the force of Eleanor Roosevelt's personality and will. What an amazing woman she was, and how much she accomplished in her lifetime! In fact, Rappaport includes her thoughts about the importance of Eleanor to her -- what a role model for women! Eleanor: Quiet No More will be a book I can't wait to share with my class, discuss the implications of the person, and pull out many more times after that to use as a mentor text. Okay, so you've selected a book, written questions and baked cookies. Well actually, the cookies are optional for you, but for Joyce and me? MANDATORY! I think some people come just for the cookies. 1. Reading Time: We usually give the kids and parents about 6 weeks to complete the book. I think this year we may have cut down on the time since we are ordering the books and they have the books in hand sooner and don't have to spend time looking for them. During that time I check informally on their progress and to see how many are potentially participating. 2. Night of the Event: We usually arrive early and set up tables in groups of 10 or 12 depending on how many we are expecting. With our crowd on November 17, did I mention we had 85? it was nearly impossible to fit them around the library tables so we actually spread out all over. As the families come in we ask that the parent and child sit together. It seems so obvious, but it re ally does need to be stated. Once the crowd has gathered we go over some basic ground rules. Things like reminding parents not to dominate the conversation, be willing to listen to their children's good ideas. We ask the kids to focus on the conversation and not be side tracked by silliness. When the questions are handed out we share that they are only suggested questions, not required and there aren't any tests or quizzes. If the conversation takes them a different way, go there, it will probably be better! The groups break off, no assignments, just who happens to be sitting near you and the the Grand Discussion is off and running. Joyce and I wander around making sure to join in on all of the groups at some point during the evening, making comments, answering questions and handing out cookies when appropriate. We usually let them talk for 30 to 45 minutes and then come back together to share especially insightful comments and I always like to take an informal poll about the general feeling about the book. I'm always interested to see if opinions change after the discussion, and interestingly enough, they usually go from a negative to a positive. That's about it for How to Host a Grand Discussion, it's really pretty simple and Joyce and I both agree that it's one of the most rewarding things we do as teachers. Due to the response to my blog about the Grand Discussion of November 17, did I mention we had 85 people participate? I thought maybe I'd do a follow up post to answer some of the questions posted in our comment section, by the way, thanks to all who visited and commented, nothing warms the heart of a blogger like comments about a post. My thought is that I'll start with the pre-discussion steps and follow up with what happens on the night of the big event. "Look at that sky." "Sure is big." HAH! I Still laugh at that one! Obviously, include the important information, date, time and place and a brief description of the rules, a parent AND child must read it together AND both must come to the discussion event. 3. Books: This has happened several ways. I've contacted bookstores and warned them about our event and the stock up. Other times students get them from the public library. This year I've worked with Selections Book Fairs and the students have the opportunity to pre-order the books and they are shipped to the school. I think the parents like the convenience of having the book brought to them. Another idea that I haven't tried is to use a book that the school already owns multiple copies of, the problem here is that you run the risk of choosing a book that many of the students have already read. 4. Discussion Questions: We usually come up with a set of questions to get the discussion started, these are only suggested questions, we always encourage our groups to go off the script if the discussion takes them there. Typically we are able to find some discussion questions on line, but if the book is new, like Bystander, we actually have to rack our brains to create our own. In my next post I'll talk about the night of the event. The only other pre-discussion preparation is to bake cookies. Joyce takes care of this. The last discussion tested her abilities and patience, baking for 85. My guess is it also depleted her supply of parchment paper, keeps them from sticking you know. Ok, I forgot to tell you 2 more very special parts about the session I attended on book choice Friday. First, Donalyn Miller, of The Book Whisperer fame, was there, twittering about how excited she was to hear this particular group of women present. There is actually a group photo that I am in with Donalyn after the presentation. I will forward it as soon as my friend, Lisa, who managed to be the only one with a camera ready, sends it my way. Second, my friends (some new and some old) from Choice Literacy joined the session as well. Like I said in my first post, LOTS of smart people in one room -- it was incredibly invigorating! Moving on to Saturday -- I was thinking about technology and literacy together all morning. I started by listening to a panel of which Kevin Hodgson was a part. They talked about assigning and assessing multimedia writing. Kevin shared how he, working in tandem with his students' art teacher, science teacher, and librarian, helped his students make digital picture books on a scientific concept (cell mitosis) complete with animation and video. He used the Magic School Bus series as his mentor text. Another presenter, Dawn Reed (a high school teacher from Michigan) had her speech students compose very moving essays / podcasts titled "I believe...". I found myself making all sorts of connections to possibilities in my own classroom. Then, I went to hear Bud Hunt and Troy Hicks (author of the Digital Writing Workshop) speak about Newer Literacies and Technologies. These two men are brilliant! I can't wait to read Troy's book! These men were twittering and answering questions in real time with the audience. Their mental agility was phenomenal! And they had pretty wicked senses of humor, as well. The thing they said that stuck with me is that the technology needs to be part of a writing workshop process where students have choice and time to write. See what I mean about them being brilliant?!! Stopped by the exhibit hall after all this technological information, and picked up even more books. I was especially excited to get Patrick Karman's latest series, Skeleton Creek, and have him autograph them. I also got to meet Lisa Yee. After that, I got to hear Kelly Gallagher and Jeff Anderson speak about Rethinking Literacy Instruction. Kelly Gallagher is the author of Readicide, Jeff Anderson is the author of both Mechanically Inclined and Everyday Editing. Many great points were made. Even though their target audience was probably more middle and high school, I was able to take away many good ideas. I ended my day listening to an authors' panel about blogging. My blog and author friend, Barbara O'Connor, was part of the panel, so I really wanted to hear what these authors had to say. It was interesting to listen to them talk about how much the time they spend blogging means to them. Fascinating insights into each one of them, but especially good to see Barbara again. Out to dinner for Italian food with Dublin friends Saturday evening. I found myself in disbelief that the weekend was drawing to an end. If you've ever been to the NCTE convention, you know what I mean when I talk about the rush I felt being surrounded by not only smart people, but people who share similar beliefs as me when it comes to literacy, and more recently, 21st century literacy. I left the convention feeling so energized!!! It was an amazing weekend. I'm currently in Philadelphia for the NCTE convention. I am a first-timer to the convention, and all I can wonder is why I haven't made it here before! Since the moment the convention began on Thursday, I have met and listened to a multitude of very smart people. My first session on Thursday was headed by Ralph Fletcher and was titled The Pleasures of Language. The entire session was about how we, as teachers, need to make words and language more fun for students. Ralph shared a multitude of ways that we can have children play with language. He was joined by two other presenters -- Kate Norem-Morris from Washington and Gresham Brown from South Carolina. Kate talked a lot about having students gather wonderful words for themselves and then "releasing" the words into their writing -- great idea! I can't believe I've never heard about Gresham or his blog (stoneacademyroom241.blogspot.com) before. Gresham encouraged teachers to create a playful room, full of jokes, songs, chants, tongue twisters, and poetry. I could have listened to him tell stories about his classroom forever. This session was followed by the Elementary Section Meeting. What great fun! I sat at a table hosted by Franki Sibberson. The table also included Sharon Taberski, Pat Johnson, Ann Marie Corgill, Nancy Johnson, Mary Lee Hahn, Karen Szymuziak, and Katie DiCesare. Can I tell you how fun it was to be surrounded by all those smart people?!! My first session on Friday was actually a presentation put together by Mary Lee Hahn, Katie DiCesare, and myself on how writing a book, making a video, and blogging have all made us better reading and writing teachers because of how much we have had to reflect on our own reading and writing processes. And all these things - writing, being on camera, blogging - forced us to take risks we might not have otherwise done. Don't we ask our students to do that each and every day at school? We had spent time planning together and that process really helped us grow as well. We were delighted with the turnout and the reception of our message! Then, I got to go to a session where someone else was doing the work -- a group of teachers from California talked about the power of using blogs, podcasts, voicethreads, and digital videos with 4th graders. I came away energized to get back to my own class of 5th graders and to start diving into technology with them. More importantly, to find the best way to embed technology into everything they do, especially writing workshop. Lunch was at this fabulous market across the street from us -- best turkey reuben I've ever had -- very yummy! Then, Friday afternoon, I attended another session titled "Book Choice Matters", and the presenters were Ann Marie Corgill, Debbie Miller, Franki Sibberson, and Karen Szymuziak. They made me think a lot about what "just right" actually means, and if a child needs to always be in a just right book -- there are times it is appropriate for readers to read easy books and challenging books. My second session was supposed to be The Significance of Teacher Talk by Peter Johnston, but by the time I got to the room, there was a crowd already outside. There was no way to pack even one more person in that room. I was disappointed, but recouped my good mood by doing some retail therapy. I went to the Exhibit Hall, and found many free ARCs, but I also paid for other books I was dying to have for certain students. That night, dinner at a local pub where I was the oldest person in the place. Tons of fun and good times with my fellow Dublin NCTE participants. Tune in tomorrow for the second half of my exciting weekend at NCTE. Several years ago my friend and colleague Joyce and I started an event for fifth grade students and parents. We pick a book, have the students read with a parent and then we all meet together for an evening discussion of the book. We called it The Grand Discussion and both of us think it's one of the best things we do as teachers each year. On Tuesday, we convened in the school library to discuss James Preller's newest book, Bystander. I reviewed it here and I honestly think it should be required reading for students in middle school or just getting ready to enter middle school like our students are. Well, the turn out was of record proportions! Typically we have between 40 and 50 people at our events and Joyce and I pat ourselves on the back and say, "Job well done!" Imagine our surprise when people started showing up, and kept showing up, and then some more showed up, and then we started welcoming everyone and some more showed up and in the end around 85 people were at the most recent Grand Discussion! 85! That's right, 85! I pulled all of my chairs from the back room and Joyce and some boys dragged some chairs from the second grade classrooms across the hall, and we still didn't have enough! IT WAS AWESOME!! We had people discussing Bystander in THE PIT! We had people discussing Bystander in The Commons! We had people discussing Bystander ALL OVER THE LIBRARY! IT WAS AWESOME! I discovered this one on the new book table at my local library, Not Last Night, But the Night Before by Colin McNaughton, and I've been reading it to everybody, pre school through fifth grade, and it's been fun. Each page starts of with "Not last night, but the night before" and then someone is knocking at the door. Each time it's a fairy tale or nursery rhyme character. One time it's three little pigs, another time it's Goldilocks, or Little Bo Peep, or Little Miss Muffet. Each time the door is opened, the characters come in, knock the story teller down and take their gifts upstairs. I still laugh every time I sing it, the kids laugh too. It's just plain silly fun. Another fun feature to the book is guessing who will come with the character at the door. For example, the big bad wolf comes with the three little pigs, the three bears come with Goldilocks, and a big fat spider squishes the narrator with Little Miss Muffet. The illustrations by Emma Chichester Clark are bright and fun and make the reader feel like they are at a party with all of their favorite characters. Every September I struggle to find an appropriate book to commemorate the World Trade Center tragedy. Finally I have found one that while it remembers that horrific day, it has an uplifting message of peace. Next September 11, I will share 14 Cows for America in THE PIT. 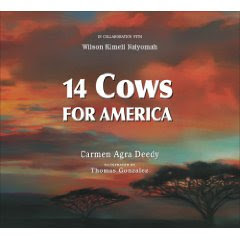 Written by Carmen Agra Deedy and illustrated by Thomas Gonzalez 14 Cows for America is beautiful to read and to look at. The author collaborated with Wilson Kimeli Naiyomah the Maasai tribesman whose story is told. Kimeli was in New York City on that tragic day and he witnessed the events. He was a student in the United States and his gentle warrior heart felt compelled to do something to help. When he returned to his native Kenya and told the story of the attacks, and the devastation experienced by the people of the United States, his countrymen were also alarmed. In the tradition of his people, Kimeli offers up the most sacred of things a man can own, his cow. As the warrior offered up his gift cow for blessing to give to the grieving people of the United States, 13 of his fellow warriors did the same and fourteen cows were blessed for the people of the United States. The American ambassador and his wife were moved to tears when hundreds of Maasai stood in respectful silence as the Star Spangled Banner played during the presentation of the 14 cows. Holding with tradition, the fourteen cows could never be slaughtered and now with offspring, the herd totals 35. This simple yet moving story is beautifully illustrated with scenes from Africa. The colorful artwork captures the splendor of the continent and the beauty of its people. This is an awesome book. Watch the cool trailer here. Mary Lee interviewed Thomas Gonzalez at A Year of Reading. Author James Preller interviewed Carmen Agra Deedy. Operation YES is a Definite YES! I'm taking a quick break from our CYBILS reviews because I'm so excited about this book by Sara Lewis Holmes. 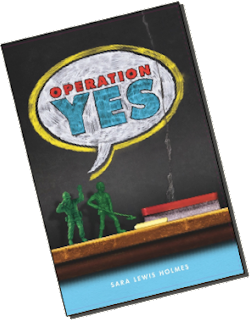 When I learned that I would be meeting Sara at the KidLitCon in DC, I really wanted to read Operation Yes, but alas, I was unable to get a copy at my local library. After meeting Sara, I was on a mission. I went to the library on Monday with an Operation Yes postcard in hand ready to tell whoever would listen that they needed to order this book, and they needed to put me first on the reserve list! Well, I was quickly deflated when I found that it had already been done, and I would have to settle for third place on the reserve list. When I finally got my hands on the book, I couldn't put it down. It kept me interested from start to finish. I'm sort of a sucker for books about kids in school and Operation Yes doesn't disappoint. Set on an Air Force base in North Carolina, Bo, the commander's son, is in the sixth grade and something of a trouble maker. His new teacher is unusual to say the least. First of she's short, smaller than many of her students, she has multiple piercings in her ear, and the students discover a small bird tattoo. Miss Loupe uses some interesting teaching practices to engage her students, her specialty is improv and the kids love it. Bring in Bo's cousin Gari from Seattle. Her mother, an Army nurse is being deployed to the Middle East and Gari needs someplace to stay. Bo's parents take her in and she becomes part of Bo's life, a fact neither really appreciates. Brought together by a war related tragedy in Miss Loupe's family, the sixth graders band together to help their teacher and her brother through a tough time. They organize and carry out a fund raiser for men and women wounded in service to our country that includes thousands of green army men and a pretty funny play. All in all, good clean fun that kids will love. I was reminded of 4 Kids in 5E and One Crazy Year, kids working together for a common goal. We could all learn something from Miss Loupe. Unite or Die: How Thirteen States Became a Nation by Jacqueline Jules and illustrated by Jef Czekaj is one of the most kid-friendly books I've ever read that explains how our Constitution came to be. When I originally read the title, I assumed the book would be about America's fight for independence. This book is great because it is so much more than that. The story is told with a very clever plot device -- a school play at Forest Lake Elementary. Some of the students in the play are dressed up as the original 13 colonies. The story begins right after the American colonies have won the Revolutionary War, and the Treaty of Paris was signed in 1783. Turns out the colonists have spent so much time unified as a group, fighting against King George, that they really don't know how to live together as one country. Jacqueline Jules uses great dialogue between states in the play to show how much self-centeredness and bickering was actually taking place among the states. Students will be able to identify with the characters Jules has created in the states. Each one has a distinct personality and its own wants and needs. Because of this bickering, the United States of America was not able to function effectively and something had to be done. The story does a nice job explaining all the different events and plans that take place as representatives from the different colonies met in Philadelphia to try to find a government that would work for all. Jules does a wonderful job mixing the facts of these events with the dialogue of the states (in speech bubbles, no less). During all of this, the dialogue of the states propels the story forward in a way that children will be able to understand. Because of this dialogue, the reader is better able to understand the need for the three separate branches of government provided in the Constitution. But if all that weren't enough, the last two parts of the book were the clinchers for me. There is an afterword that more fully explains the Constitution and focuses on the fact that these state delegates from long ago, formed a document that could change with the times that they could not even imagine -- a great introduction to the power of amendments. Finally, little questions that I found myself asking while reading the text like, on pages 28-29, "How did Roger Sherman save the day? ", are asked and answered in the last section. So many great facts that kids will love to find out! Unite or Die: How Thirteen States Became a Nation was given to me by the author as a courtesy at the most recent kidlit blogger conference. How exciting that I was able to meet the author of this Cybils nonfiction picture book nominee! Even more exciting is how I will be able to use this book in my own 5th grade classroom. I would be remiss if I didn't give a tip of the hat to Jef Czekaj for his wonderfully amusing illustrations that children will love! In the Trees, Honey Bees by Lori Mortensen is an interesting combo for me. Written in rhyming phrases the book passes along a lot of information. It's almost as if it was written for readers of two or more levels. Then on the same page is a paragraph that explains, in higher, more scientific language, what the rhyme is all about. The paragraph that goes with this rhyme talks about the scout bees looking for flowers rich with nectar and pollen. They then return to the hive and tell the others where to find it. In addition to the text levels, the illustrator, Cris Arbo, presents yet another level of information. The illustrations are realistic and detailed. So much so that emerging readers could use them to learn about honey bees and the work that they do. The edition I looked at included something I have never seen before. Apparently one of the illustrations has the hive positioned incorrectly. On that page is a sticker that tells of the error and how it will be corrected in future editions. I like this book a lot because of how it will reach readers of all levels. It will make a great tool for teachers to use with and entire class because of that fact. I can also see it being used in a "buddy class" type situation with the older students working with the younger students on a common project on honey bees. When I agreed to be a panelist for the Cybils nonfiction/informational picture book category, I'm not sure I realized how much work it might entail. However, there is most definitely a silver lining to this extra work -- recently, I arrive home and find packages of books on my front door stoop. Talk about dying and going to heaven!!! Just today I came home after school, and found 3 packages (6 books) waiting for me. I truly appreciate the trouble to which the publishers of the nominated books have gone to make sure the panelists are all able to read each and every nominee. Thanks so much! 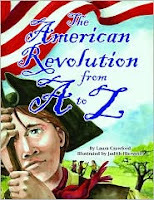 One of my finds today was The American Revolution From A to Z by Laura Crawford and illustrated by Judith Hierstein (this review copy is compliments of Pelican Publishing Company). I was immediately drawn to this book for two reasons: 1) I love to see how different authors organize their informational ABC books, and 2) as a 5th grade teacher, I spend some time each year investigating the causes of the American Revolution with my students. Laura Crawford does a nice job sharing information with the reader. The American Revolution From A to Z is full of good details that will both reinforce concepts about the Revolution, as well as expand the knowledge my students already have. I'm not sure whose decision it was -- the author, Crawford, or the illustrator, Hierstei n, but I thought the lettering of "A is for ..." that introduces each new page was extremely well done, and tied the book together. For lack of a better description, I'll call it a colonial script - it even looks like it was done with a quill pen. I'm impressed with the manner Crawford has chosen the essential parts of each topic to share, without making the reader feel either overwhelmed or under-informed. The American Revolution From A to Z will be a great addition to other Revolutionary War picture books I've already collected. It will also be a great mentor text for student writers who want to take a nonfiction topic and write an ABC book about it. This book provides many great examples of how to combine informative text with detailed pictures. I was recently with Franki Sibberson ( Year of Reading) at a seminar she was presenting. During her seminar, she handed out a few mentor texts to support her topic. One such text was the picture book One Giant Leap by Robert Burleigh and painted by Mike Wimmer. The book tells the story of how Neil Armstrong and Buzz Aldrin landed on the moon in the Eagle while their fellow astronaut, Michael Collins, continued the orbit of the moon on his own in the Columbia. What a phenomenal moment in history! For all of us who watched this unfold on our black and white TVs (and even for those of you too young or not born at the time), this book captures the feelings of worry (would they be ok landing and taking off from the moon), excitement (as Armstrong and Aldrin climbed down the steps of the Eagle and then bounced around on the moon), pride (that NASA has been able to accomplish this feat), and disbelief (how could man be on the moon, or even in outer space). The story is told completely in verse, with amazing language for children to hear and read over and over. This is a book meant to be reread many, many times! The paintings by Wimmer are breathtaking -- they capture the words of Burleigh perfectly. The story gets inside the feelings and emotions of Armstrong, Aldrin, and Collins, and lets the reader know what they were thinking during this monumental moment in history. That technique draws the reader in even more. We are soon approaching the 40th anniversary of this event - July 20, 1969 - so this book is a very timely. One Giant Leap can bring this event alive for an entire new generation. And, on a personal note, in addition to everything else I've listed, this will be a great book to add to the Earth and Moon study I do with my students. This is a fabulous book, and I am so glad I have it! I have many excellent nonfiction books in my classroom collection, but only a few are like "magnets" to the entire class. I believe One Giant Leap will be another one of those "magnets". I can't wait to share this with my students! If my math is correct, and keep in mind I haven't had to teach it for 2 years or so, there are three titles nominated about Charles Darwin. Now I know this is the bicentennial of his birth, and I know he shares a birthday with Abraham Lincoln, but I'm still surprised at the number of new picture books about Charles Darwin. 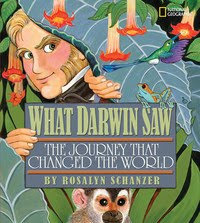 He seems a much more complicated figure than can be covered in a picture book, however, What Darwin Saw: The Journey That Changed the World by Rosalyn Schanzer does a good job of bringing the subject matter down to a kid friendly level. After a brief introduction to Mr. Darwin, the book begins to look like a graphic novel with short text, entertaining, action filled illustrations and most of the information takes the form of speech bubbles. The book is done in first person with Charles Darwin sharing his observations of his travels through the jungles of South America, Tierra del Fuego, and the Galapagos Islands. I love the pictures showing his discoveries, especially the section called "The Mystery of the Big Bones." Drawings of his discoveries are shown and then drawings of what the creature may have looked like are superimposed over them. The animals are drawn sometimes in humorous caricatures, like a frightened lizard playing dead, and sometimes more realistic like black lizards and giant tortoises of the Galapagos Islands. Overall, I like this one and think kids will too. The info is not too heavy handed and presented with enough humor that it should keep their interest. The fact that it is published by the National Geographic Society lends a good deal of credibility in my opinion. 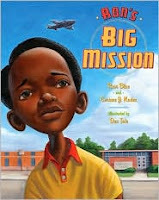 Ron's Big Mission by Rose Blue and Corinne J. Naden is the story of Ron McNair, a black man who grew up to be an astronaut, and unfortunately died on January 28, 1986, when the Challenger exploded. But this story is not about Ron McNair, the astronaut. It is far more about Ron McNair, the brave young boy who changed things forever in his town of Lake City, South Carolina. Ron was a youth that liked to frequent the town's public library. He would read everything he could get his hands on that dealt with aviation. But Ron was unlike most patrons of his public library. Because his skin was black, he was not allowed to have a library card and check out books from the library. His reading all had to take place at the library; not in the comfort of his own home. One day Ron made a stand... literally. He gathered a pile of books on aviation, took them to the front desk, and asked to check them out. When no one would respond to his request, he jumped up on the circulation desk, stood there, and announced quietly to all within earshot that he would like to check out the books. People reminded him that he was black and only white people could check out books. He stood his ground, and eventually the Lake City police and his mother were called. Despite many people telling him it was impossible to check out books, he stayed determined. He asked why he shouldn't be allowed to check out books like all the other students. In the end, we see Ron walk out of the library with a library card and a pile of books that were important to him; important enough for him to stick up for what he believed was right. In the Author's Note at the end, the authors say, "This story is a fictionalized account of a real incident in Ron McNair's life." That being said, based on the interviews the authors did, I'm inclined to believe that this version is close to what actually happened. The illustrator for Ron's Big Mission was Don Tate. The illustrations are reminiscent of some of Kadir Nelson's work, with the oversized heads and the large, expressive eyes. Watching the Challenger explode is one of those tragedies that I'll never forget -- the disbelief something like that could happen. Ron McNair, along with his crewmates, is truly remembered as a hero. Ron's Big Mission is a little misleading -- it would appear that Ron McNair was a hero long before he ever became an astronaut. Being the person who paved the way for black children and adults in Lake City, South Carolina, to get their own library cards; taking a stand for what he believed was right -- that is when he first became a hero. 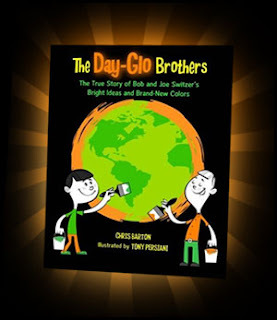 The Day-Glo Brothers: The True Story of Bob and Joe Switzer's Bright Ideas and Brand-New Colors by Chris Barton was a surprise for me. When I saw it on the list of nominees, I thought, REALLY!? I mean how much of a story could there be behind the neon colors that we all grew up using to make all of our school projects POP! Turns out, it's a pretty interesting story of experiments and accidental discoveries. The Switzer brothers were opposites in many ways, Bob, the older brother, was a planner, a worker, a goal setter. Joe, on the other hand, liked magic and spent hours teaching himself new tricks to amaze his friend, he was also something of a problem solver. The combination of Bob's planning and Joe's creativity they built themselves an ultraviolet lamp and discovered that some of the chemicals used at their father used in his pharmacy glowed in the lamp's light. This accidental discovery made them want to discover more, so they went to their local library (I love that part, by the way) and began exploring the glowing properties of different chemicals. All of their experimentation led them to a life of selling and improving their product. Eventually, in Cleveland, OH, they created the Day-Glo colors, tested them on a billboard in Sandusky, OH and VOILA! fluorescent paints were invented. I like the story of the brothers' mistakes and accidental discoveries. I can see this book being used to teach scientific inquiry in upper elementary classes. It can certainly be used to encourage kids to not give up, but learn from failures. The illustrations by Tony Persiani are black and white until the brothers start experimenting with the glow properties, and then the book gets brighter and brighter with the neon that seems to be making a bit of a comeback right now. I like the simple black line drawings that remind me of the educational and training cartoons from my childhood. "Annette Kellerman loved to make waves." On this page, the illustrator, Fotheringham, shows Annette in a bathtub with water and waves splashing wildly out of the tub. From this first page forward, the reader is guaranteed two things for each 2-page spread: 1) we will find out all the different ways Annette Kellerman "made waves" by learning about both her acccomplishments, as well as some of her failures, and 2) we will visually see the wave pattern on every spread, rather the waves are in the design of clothes, or in the sky, or in the background, or even in the illustrations of water itself. This "wave" theme that both author and illustrator continue is cleverly done, and is very appealing to the senses. The fact that this is a book about a strong woman is even more reason to like it. Annette's accomplishments help define why she made "waves": overcoming what appears to be an early disability, becoming a strong swimmer, combining her swimming skills with the ballet she loved to watch, moving from Australia to England with her father, trying to swim the English Channel, earning the nickname the "Mermaid Queen", performing in front of royalty in a newly designed outfit considered scandalous at the time (a precursor to the bathing suit), traveling through Europe performing her water ballet, and eventually coming to the United States, where she first scandalized people who saw her in the suit she wore to the beach and performances. The author, Shana Corey, gives the reader enough information to both educate and entertain during the course of the story. Then, for those readers who are intrigued enough to want a little more information about Annette Kellerman, Corey includes three extra pages at the end with more detailed information on Kellerman's life. Everything about this picture book is appealing -- the front cover, the topic, the details, the illustrations, a nd the "wave" theme. Mermaid Queen is a must read! Mermaid Queen: The Spectacular Story of Annette Kellerman, Who Swam Her Way to Fame, Fortune, and Swimsuit History is also one of the books nominated for a Cybils award in the category of nonfiction / informational picture book. I read this book the first time several months ago, and really liked it. I was originally drawn to the title because I've been told I bake a pretty mean apple pie myself! OK, OK, I don't like to brag, but it's true, I bake a pretty mean apple pie if I do say so myself. Anyway...this book is about chef Edna Lewis who was a pioneer in the area of utilizing fresh fruits and vegetables when cooking. She was also one of our country's first famous African American chefs. The book begins in spring when Edna was growing up in Freetown, VA and her family marked the seasons by what was ready to harvest. In the spring it was wild strawberries, wild greens, and sassafras. Then it was summer with honey, cherries, blackberries, peaches, watermelons and tomatoes. Fall brings apples, grapes and wraps up with wild nuts from the trees. All of nature's treats are preserved and stored for the winter while they are at their freshest. This would be a hallmark of Chef Lewis' gourmet cooking. Ingredients freshened by the sun and nature. As the family eats the goodies through the cold months, the memory of summer and the harvest keep the family warm. Bring Me Some Apples and I'll Make You a Pie by Robbin Gourley is a wonderful story about a food pioneer. Done with colorful illustrations and a bit of poetry, the book finishes with some of Edna's recipes and an author's note about her life.